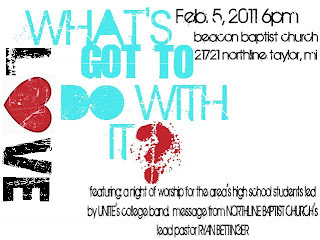 We are going to a local [YOUTH RALLY]: "What's Love Got To Do With It?" We are looking forward to hearing about what God has to say about love, dating and relationships. Should be interesting since God is the one who created us to love, and we are able to love because He loved us first! I am so thankful that God protected me during high school and college, because I definitely had the opportunities to be stupid or for stupid things to happen especially when it comes to guys. It took me a long time to figure out what I wanted in a man and it took an even longer time for me to figure out that what God created in a man for me is [MOST] important. Now that I have married the one that God created just for me I know how [AWESOME] God's plans are and how awesome things can be when I trust in Him. I'll let you know what we learn about God and love at our up coming youth rally.